Hello! This card was inspired by the challenge at Double D Challenges- Kitchen is the Heart of the Home. I pulled ideas from the collage shown below using vintage feel, colors, and utensils from the photos. I used a birthday theme since Double D is celebrating their second birthday/anniversary. I used the sketch from Tuesday Morning Sketches for my design. Supplies used: Stamps from old Mark's Finest Papers set, Red and White CS, pattern papers from MME and stash, Memento Gray and Black inks, Clear EP, Copics, Silver Pen, Circle Dies. Simon Wednesday Challenge: Simon Says Layer It Up. Fantastic birthday card for anyone who loves to cook! Love the vintage look. Thanks for joining us at Tuesday Morning Sketches. This is FABULOUS Theresa! 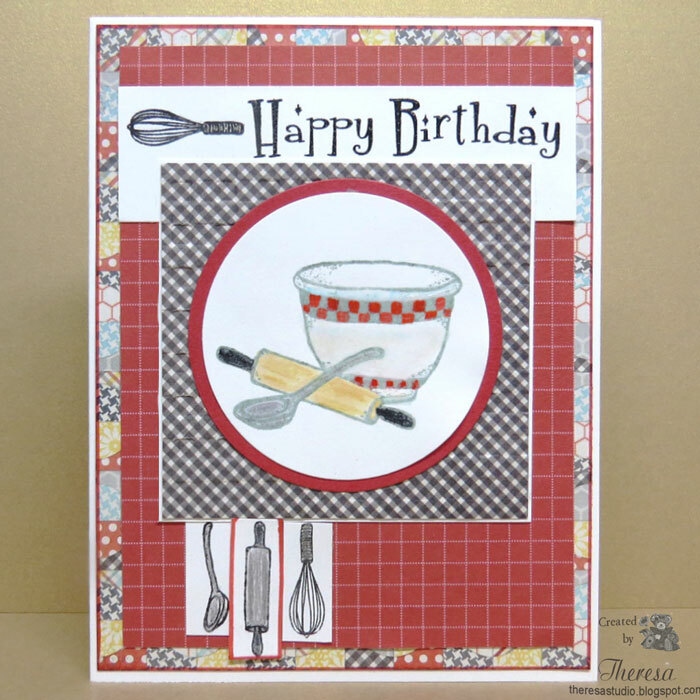 I love the kitchen elements you pulled together for your card! Great job! Thanks so much for joining in the fun at our Double D ‘Kitchen is Where the Heart Is’ challenge! Good Luck and we hope you’ll come back often. Great card, Theresa! Love the blocking and clean lines. Fun kitchen details! 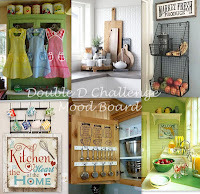 Thanks for joining the Double D, "Kitchen" Challenge. How fun?!! Love the way you did the flags. Thanks for playing along with us at Tuesday Morning Sketches this week. What a fun card! I know lots of bakers that would love this!! Fantastic kitchen card with all the added elements!! Thank you for joining our challenge at Double D! Adorable card! Such a sweet image! Love the fun design too! I really love the kitchen theme! And great combo with the sketch! 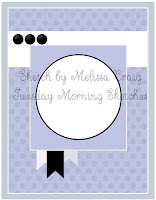 Thanks for your entry to CraftyHazelnut’s January Patterned Paper challenge! Hope to see you at February’s challenge, too!